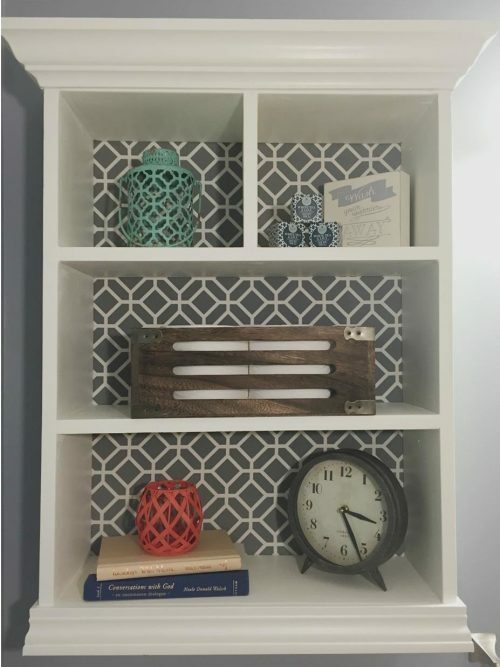 As promised in my One Room Challenge reveal, here is the tutorial on how to add a little twist to your shelving unit using fabric. I first saw the idea of decorating the back of your shelves at A House Full of Sunshine. However, she used a stencil to create the pattern on the back. 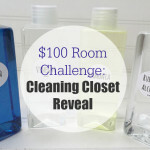 During the One Week Challenge, I saw another example from Winder and Main, and she used a shower curtain for her backing. Clever, right? 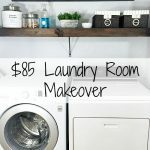 I’m sure there are multiple options for how you could pull off this look (I also thought wallpaper…), but I’ll tell you how I ended up doing the shelving unit for our powder room. Fabric- I chose an outdoor fabric as it was much more durable than other types of fabric. You want your fabric piece to be at least an inch wider than your shelf backing all the way around. 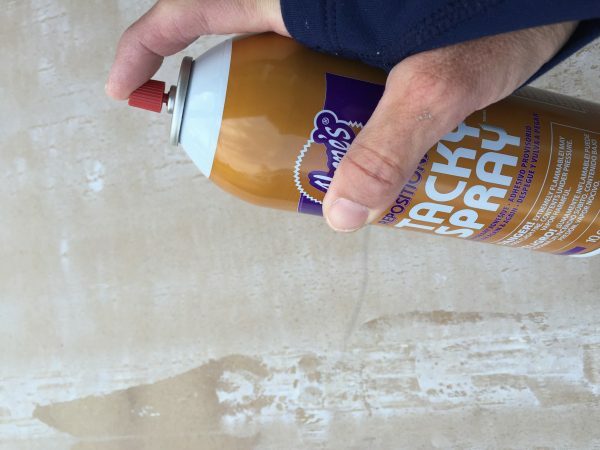 Adhesive Spray- There are options when it comes to adhesives sprays. You can get one that will permanently hold things in place, or you can get a tacky spray that will allow you to remove/reposition your fabric. The choice is really yours. I chose to go with one that I could remove/reposition because that way I can change out the fabric, and if I make a mistake when applying the fabric, no worries, I can remove and reposition the whole thing without much effort. Start by ironing your fabric if it’s at all wrinkly. 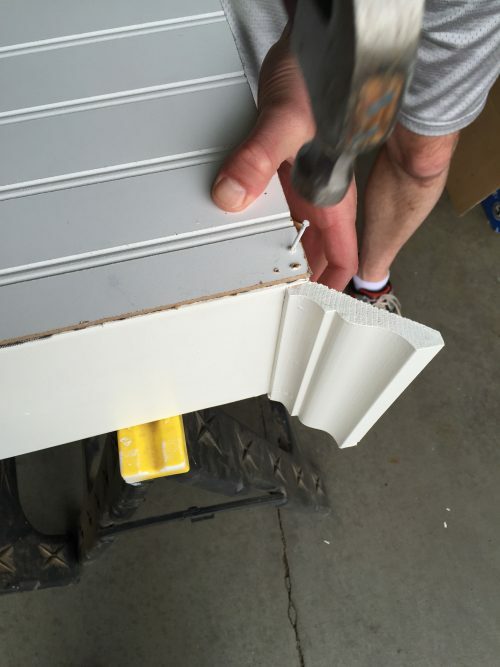 Then remove the backing to your shelving unit. 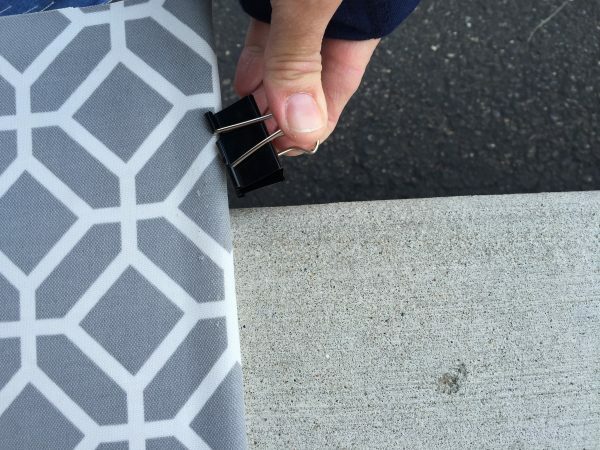 Secure your fabric of choice to the backing with binder clips. This just helps keep the fabric straight while you’re gluing it down. Take this outside because you probably don’t want adhesive glue sprayed all over your house. 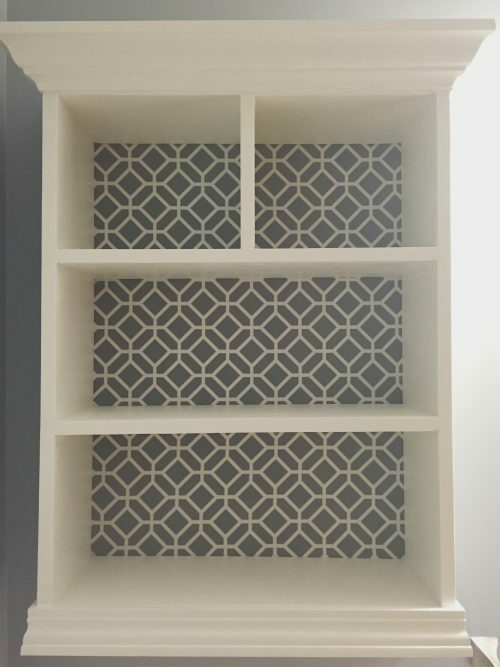 Flip the fabric up so the entire back of the shelving unit is showing. Spray the back with the adhesive. If you are working on a large shelving unit, just do this in smaller sections, working from top to bottom. Roll your fabric down over the backing and smooth the fabric as you go. 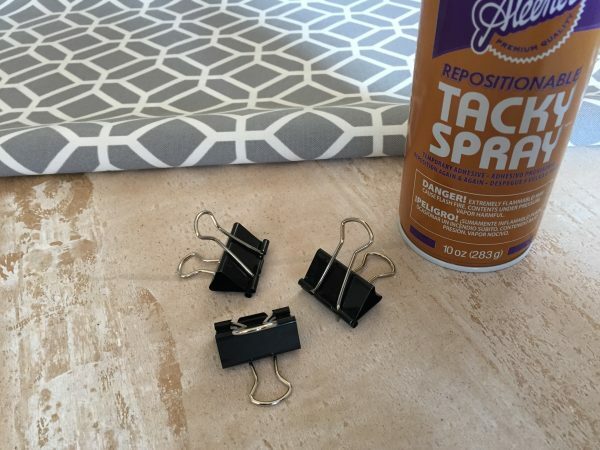 Once your fabric is beautifully in place, you can remove the binder clips and spray the adhesive underneath where they were so you are able to get the fabric secured all the way around. 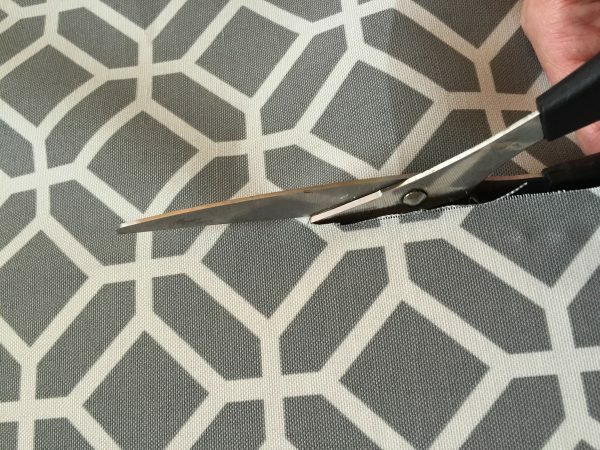 Now you can cut the excess fabric off from around the backing so it doesn’t show once you replace the backing onto the unit. Another option would be to wrap the fabric around the backing and staple it in place. 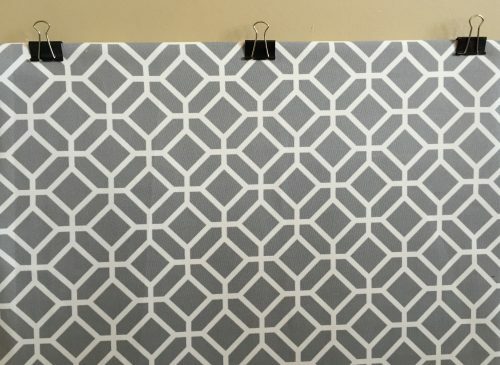 I chose to cut the fabric because when I tried to wrap it around and staple it, the backing was so dense (we used an extra piece of beadboard) that the staples wouldn’t go in. I have the perfect shower curtain for this. Thanks for sharing . Love the lanterns. Your shelf update looks great! I have a couple of book cases I’ve been wanting to do this to. I really love how it totally changes the look with minimal effort! Thank you for sharing on Dream. Create. Inspire. Link! I hope we’ll see you there again this week! I really am only able to conquer simple, easy projects, but it sure is fun when it makes a huge impact. Thanks for stopping over and I plan on linking up again this week! I love when one idea inspires another! Thank you for stopping over! Have a beautiful evening! Gorgeous! And so easy to do. Pinned it! Visiting from Lou Lou Girls Fabulous Party. Thanks for stopping over Kimberly! 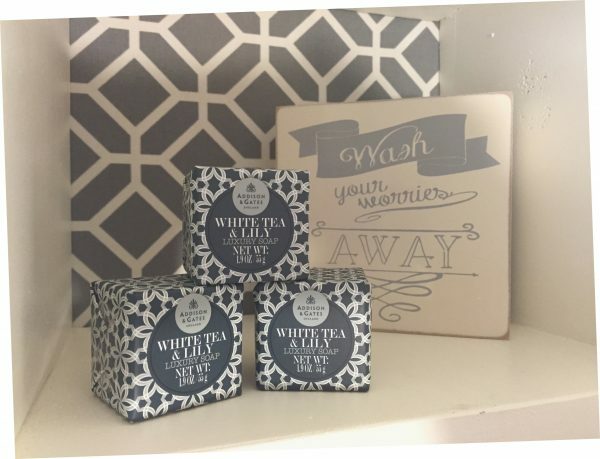 This was such an easy way to add a little something to a room. Thanks for pinning! Have a fabulous day! This is beautiful- very elegantly done. Thank you for the tutorial and for sharing at the Show and Tell party! Thanks so much Jane! And thanks for the tweet regarding this post! 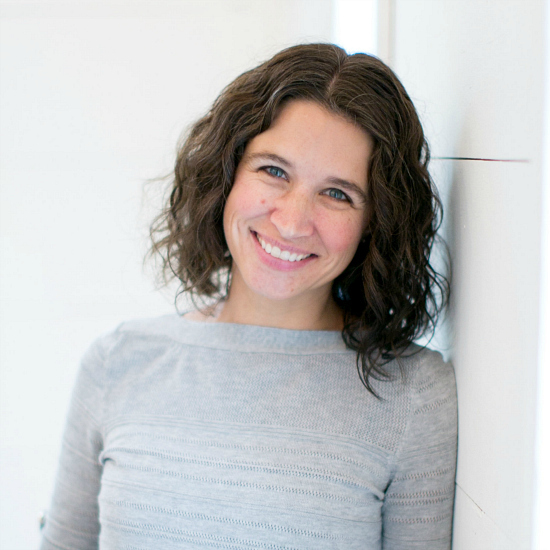 Have an amazing day… I need to click over and check out your blog now. Thanks Angela! And thank you for hosting and stopping over to comment! Have a beautiful day! Thanks Lorelai! I agree that you could do so much with this idea. Thanks for the invite over to your party. 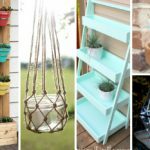 I just started blogging in February, so I’m still learning about all the great linking parties out there. I will definitely check it out. Hope you are enjoying your Memorial Day weekend! I love doing this to my bookshelves. It makes such a difference. Thanks for sharing at The Creative Circle. It’s nice to add a little color/pattern to a space in a fun way. Thanks for stopping over Kathy! Thank you so much! It would be an honor to be featured there. Have a wonderful evening Carrie! What a great idea for an apartment where you can’t paint the walls. It makes a room so much more visually interesting. Thank you for visiting and sharing with #AnythingGoes. 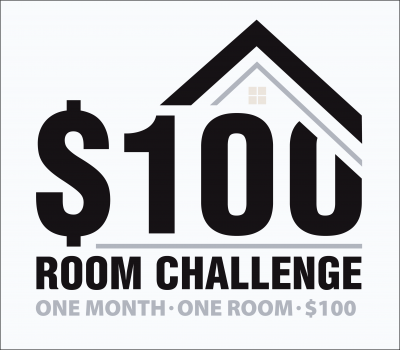 I hadn’t really thought about this idea in an apartment, but you’re right, it would be a great way to bring in some color and pattern when you can’t do anything to the walls…and think of all the different fabrics one could choose from. Thanks again for stopping over Sandy! looks fantastic! 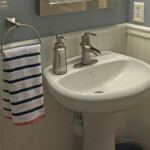 love it – so simple and makes the space pop! Thanks Lianna! 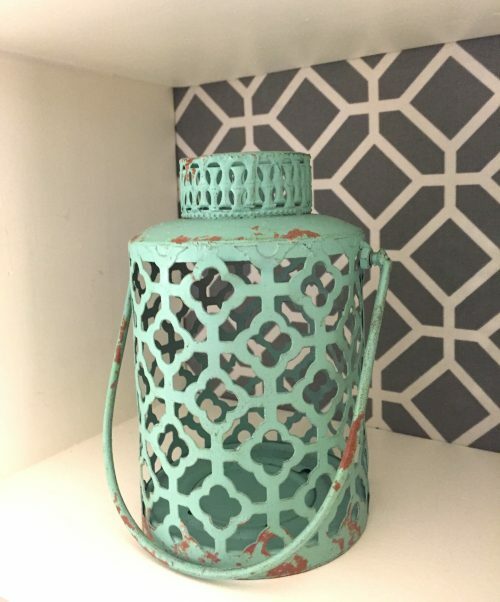 I think it’s a fun way to add color or pattern to a room (especially one that doesn’t have curtains or pillows). Hi there! Visiting from Meet Up Monday. This is so cute! I love the fabric you chose! Thank you for sharing! Thank you so much for stopping by Ashley. I just found the Meet Up Monday linking party a few days ago. Always nice to find ways to meet other bloggers and get new ideas. I might try this on some IKEA shelves in my younger daughter’s room before getting rid of them. It was so easy to do and made such a difference! And, hey, if you are planning to throw them out anyway, you might as well try it just to see if you like it!